The conference committee has put together an impressive set of workshops for our community. 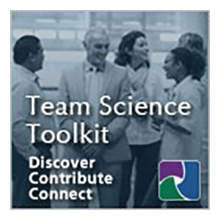 These are devised as a service for our varied stakeholders in order to enhance the professional development and evolution of the science of team science. As with last year’s conference, workshops are offered as part of your conference registration and will be held on the first day of the conference. Description: This workshop is devised to discuss the wide variety of technologies used to facilitate collaborative team science. Whether you are working in the same building, or collaborating with researchers around the world, today’s research teams can benefit from numerous technologies. In this workshop we review how to effectively use the varied features of these technologies that support team science. Description: In this workshop, attendees will be introduced to the basics of social network theories, methods, and tools. They will come away with an improved understanding of the various forms of networks necessary for effective scientific collaborations. This workshop is organized into three distinct parts. (1) The first part provides an historical overview of the motivations to view team science from a social networks perspective. This first part will conclude with a brief introduction to the concepts of social networks, cognitive social networks, knowledge networks, cognitive knowledge networks and their relevance to team science. (2) The second part focuses on using network metrics to describe team science. This part begins by defining various concepts used in network analysis: actors and attributes of actors, relations and properties of relations as well as two-mode networks. Next it describes various how these concepts influence strategies for the collection of network data. The session then defines and describes how various common network metrics are computed and interpreted at the actor, dyadic, triadic, sub-group, and component level. (3) The third part of the workshop addresses using network models to understand and enable team science. Here, a multi-theoretical multilevel (MTML) model is outlined to help stakeholders understand the dynamics for creating, maintaining, dissolving, and reconstituting social and knowledge networks in scientific communities. The session will provide a high level overview of statistical techniques to test MTML models of team science. Research exemplars are presented to illustrate the potential of the MTML framework to understand and enable team science. The session concludes with a demonstration of how these insights are being used to develop recommender systems for assembling effective scientific teams. Description: The Toolbox Dialogue Initiative (TDI, formerly the “Toolbox Project”) is a philosophically-grounded, dialogue-based approach to enhancing communication and collaboration within teams and communities. For this year’s SciTS conference, TDI is aiming to support community-wide reflection by the SciTS community on aspects of the science of team science. Following an introduction to the TDI method and its use in the SciTS community the workshop will utilize an instrument tailored to allow participants to directly create knowledge based on interdisciplinary dialogue.